As you may have noticed from the low prices at the grocery store or the band boosters selling cases of them, citrus fruits are in season now. By “in season,” we unfortunately don’t mean that they are growing locally here in North Carolina, but rather that this is the time when citrus fruits ripen in our southern neighbor-state, Florida, and therefore are available in fresh abundance here! Normally, this local-food-obsessed lady tries to stick to local fruits, even in the winter – pulling my peaches out of my freezer, jams out of my pantry, or stockpiling farmers’ market apples in the fridge… But, if I’m being honest, citrus is a non-local downfall of mine. I LOVE citrus. Especially in the dreary days of winter. Grapefruit cocktails, lemon poppy seed cake, salsa with extra lime. These are a few of my favorite things! Ok, coming back down to earth now. I’ve tried local substitutions, like gathering local-growing bitter oranges to add to our hot cider or making our lovely Wood Sorrel Lemonade featured this summer. But even with how delicious that “lemon”ade is, I can’t help but think, this would be even better with a squeeze of lemon! So, along with chocolate and coffee, citrus is one of those things I have surrendered to allowing in my usually mostly-local kitchen. Yet, I try not to truly gorge on citrus until this time of year. The time of year when it is at least regionally in season and when it tastes its very best. This just so happens to also be the time it is at its cheapest and most abundant, making it part of our Feasting in Times of Winter Scarcity series. 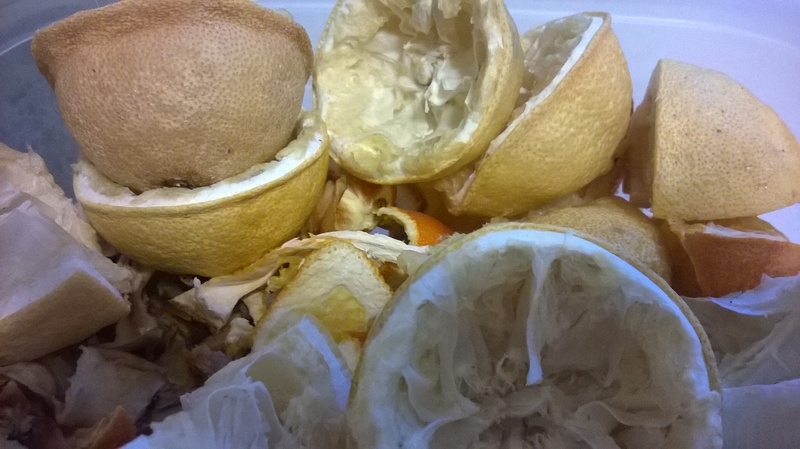 Even so, I can’t help feeling like throwing away even one bit of that citrus fruit is a waste, particularly that fragrant, brightly colored peel! To remedy this, I decided to look back at times past… What did people do when citrus fruits really were a special luxury – special enough to give and receive excitedly as Christmas gifts? They would never have just thrown away that fragrant, beautiful peel, right? As I looked into it further, I found a wealth of uses for that peel! 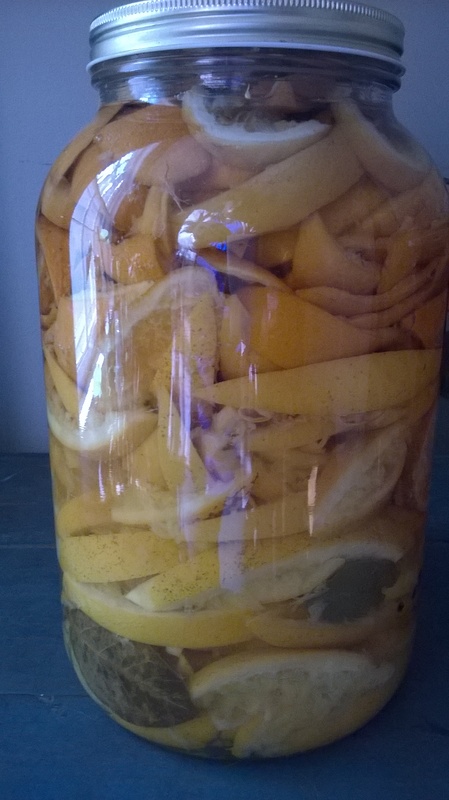 Household cleaners, flavored salts, flavored sugars, candied peel, marmalade, homemade pectin, and finally… citrus-infused liqueurs. 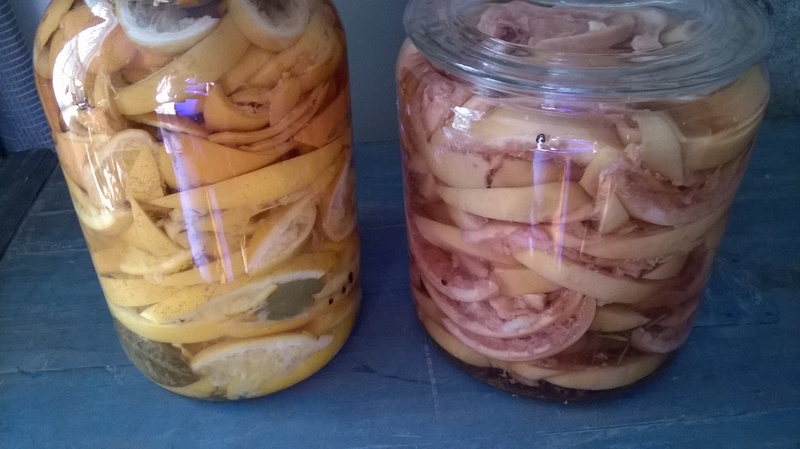 Today I am sharing one of my favorite ways to reinvent citrus peels – citrus-infused fortified wines. Just toss those peels in the refrigerator or freezer until you have enough for this recipe. This is also only the second life of at least one more use, which I’ll get to in future posts. These two fortified citrus-infused wines are based off of similar French aperitif traditions you find in the stores such as Lillet blanc. You can use “empty” peels or those with the pulp still attached (of which I have many from juicing them for cocktails). The spices and sweeteners can be interchanged or played with to your liking. They take a lot of resting time, but not much time to prepare, and they’ll keep indefinitely once complete. 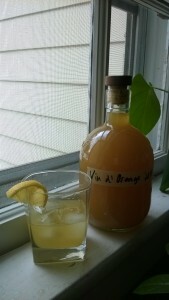 Infusing a fruit’s flavor in alcohol is one great way to hold onto it for months to come! Wash a large glass container with a wide mouth with hot soapy water. Slice peels in “smiley faces” and then in half again so each slice is about 1/8 of a peel. 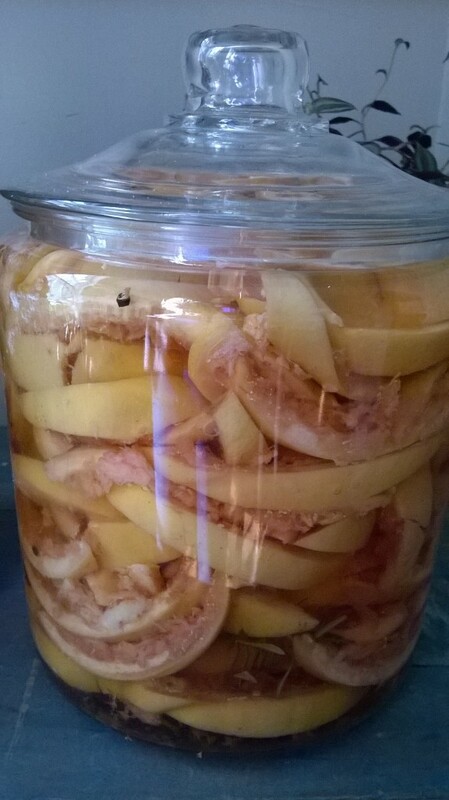 Layer peels to fill the container approximately 1/4 of the way full. Add 1/3 of each of your herbs/spices, vanilla, and sweetener. 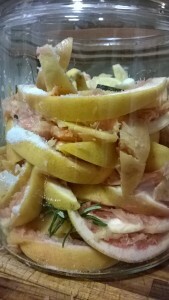 Alternate peels one quarter of the container at a time with the added spices and sweetener until the container is full. Pour over liquors and two bottles of wine until peels are entirely covered. Save any extra wine. Let sit for at least 4 weeks (or as many as 8) in a cool, dark place, shaking occasionally. If liquid level decreases (from being absorbed in peels), top off with reserved wine until all peels are completely covered. 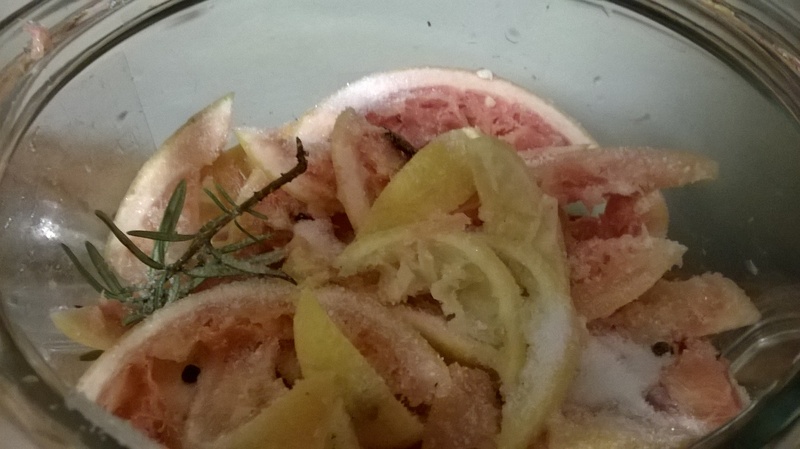 Strain out the peels and spices when the 4 weeks is through. Set peels aside for a future project. Decant vin into clean glass bottles, labeled with the contents and date. 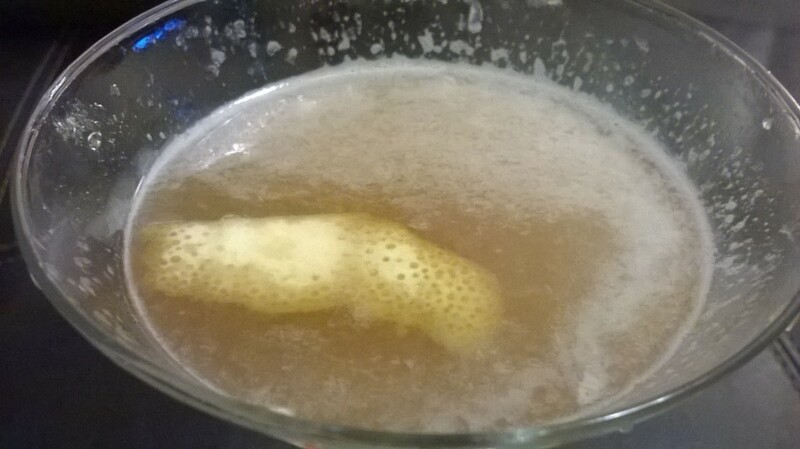 At this point you can drink immediately, or let it sit again for another 2 weeks or so to improve flavor even further. Serve straight as an aperitif over ice with a twist of lemon or use in cocktails, like the deliciously fresh one below. Combine all ingredients with ice in a shaker. Shake until contents are ice cold and well mixed. Pour strained into a martini glass. 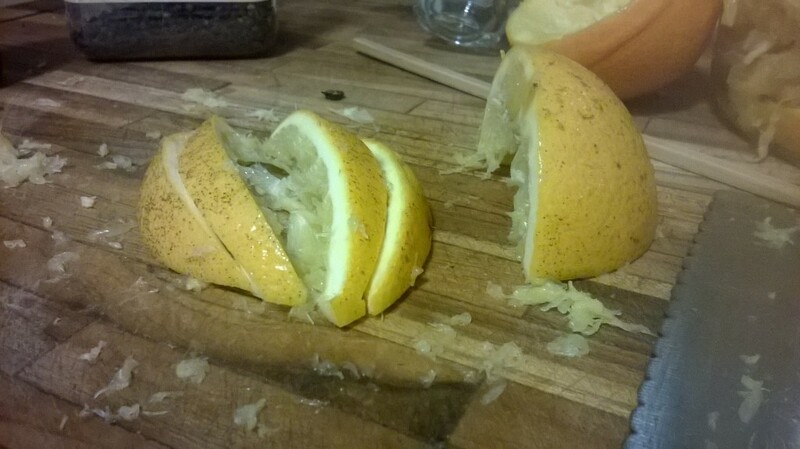 Garnish with a curl of orange zest. 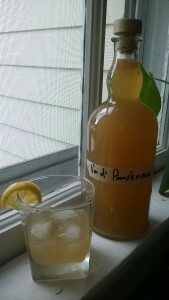 Don’t forget to throw that juiced orange peel in the freezer for your next batch of vin d’ orange! And there you have the closed-loop cocktail.